Terry, Brad and Jon from Vorshlag ran in this autocross event with the Texas Region SCCA at TMS Bus Lot, which had rain in heats 2 and 4. Brad ran in X class and got a respectable 3rd out of 10 in the Pro class and 8th out of 152 in PAX. Jon ran in the 4th heat, where a thunderstorm rolled in and limited drivers to one dry run. He still took the win in CAM-C. Terry co-drove in Mark Council's car, also in the 4th heat. 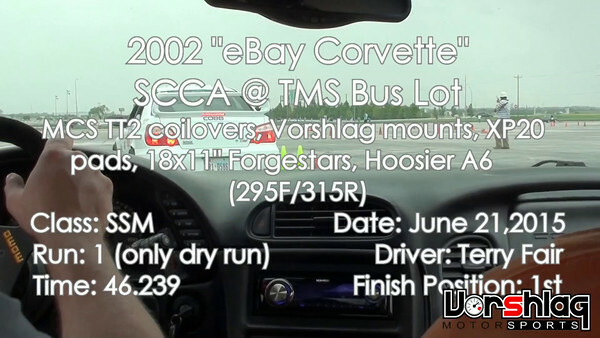 With one dry run each they manged 1st and 2nd in SSM, but were really hoping for more laps to dial in the new suspension on the 2002 Corvette (MCS/Vorshlag/Hyperco). Brad's wife Jen took the win in W on a final dry run in heat two.